We met in Rome and stayed at the Grand Minerve Hotel just behind the Pantheon, and the location was fantastic for all the things we planned to see. We had been together in Rome a couple years ago, and done a lot of the touristy things, but we still had to see the Colosseum at night, the Trevi Fountain in the morning, and eat dinner at Harry’s Bar (which gained worldwide renown after it appeared in Federico Fellini's film La Dolce Vita). 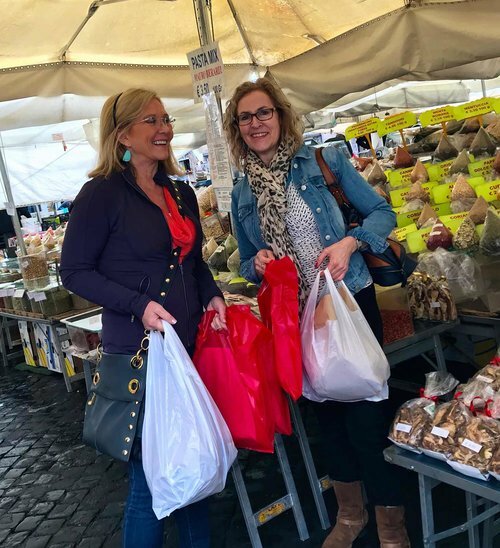 We shopped at Campo dei Fiori where my favorite vendors acted like their long lost sister had arrived when they saw me. It was a great display of affection, and Rachael was quite impressed. We bought Sicilian almonds, pistachios, sun-dried tomatoes, dried herb seasonings, and jars of truffles. We had promised each other we wouldn’t buy much, but the charm won us over and we lugged our shopping bags back to the hotel room in wonder of how we would get it all home. I do this every time I go to Rome (and never regret it). After getting Rome out of our systems, we took a train to our “Tuscan holiday destination” in Cortona, a small city that sits high on Mount Sant-Egidio overlooking rolling hills and Lake Trasimeno. The medieval and Renaissance architecture is beautiful, and the narrow streets will take you to many viewing points overlooking the valleys. When we arrived to the train station, we met our taxi driver, Francesco, who took us to the Cortona Resort and Spa where our huge room awaited us. We couldn’t wait to unpack and set up camp! The grounds were immaculate and overlooked a beautiful Tuscan valley. There was a heated pool, spa, friendly staff, and High Tea Time in the parlor! It was so cool. 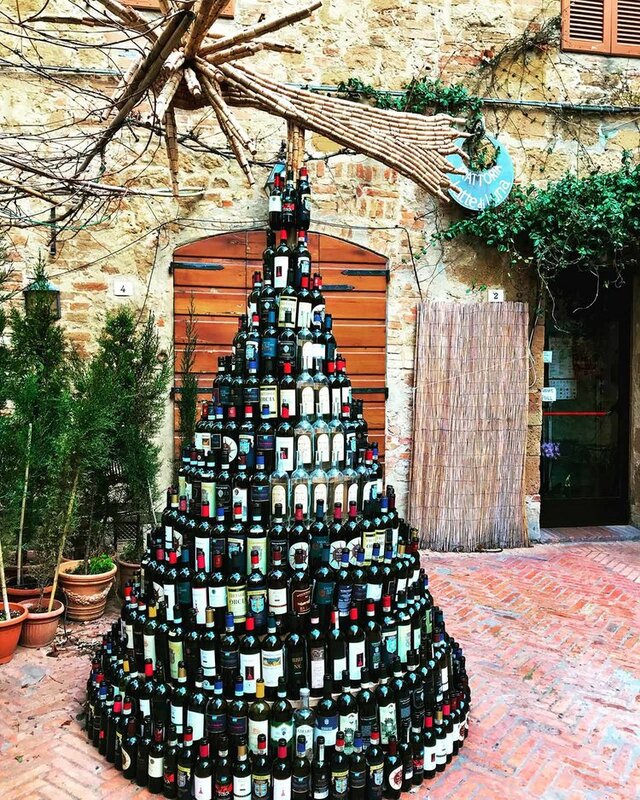 We hired Francesco to drive us to the Tuscan towns of San Gimignano and Siena. I’ve been to both places several times during the high seasons of summer and fall, and the crowds of tourists are ridiculous. However, this time there were nearly no tourists at all. It was absolutely incredible! We had a marvelous time shopping and walking down residential streets, eating gelato, drinking espresso, sipping wine, laughing all the way. 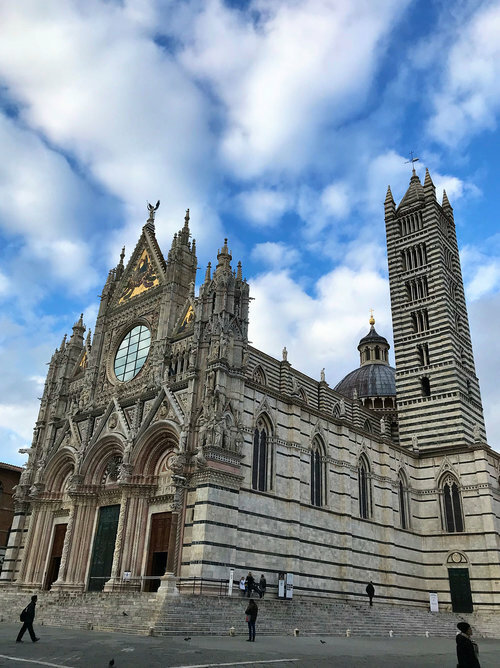 Our climb up the tower in Siena was one of the most special moments of my life. 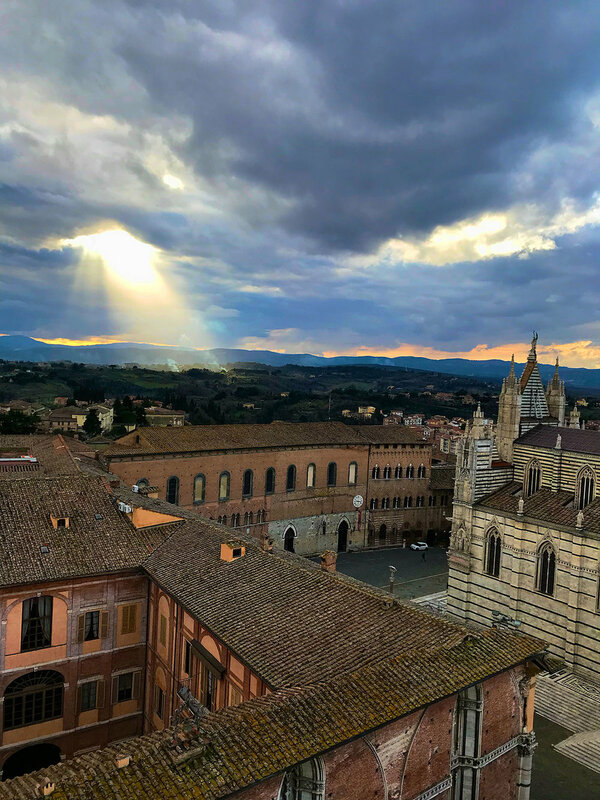 The sun shown through the clouds just next to the Duomo as if the heavens were opening, and we couldn’t get enough photos to show as proof it was really happening. We spent a great day with Antonella Piredda, an incredible guide for the area of Sienna and Montepulciano. 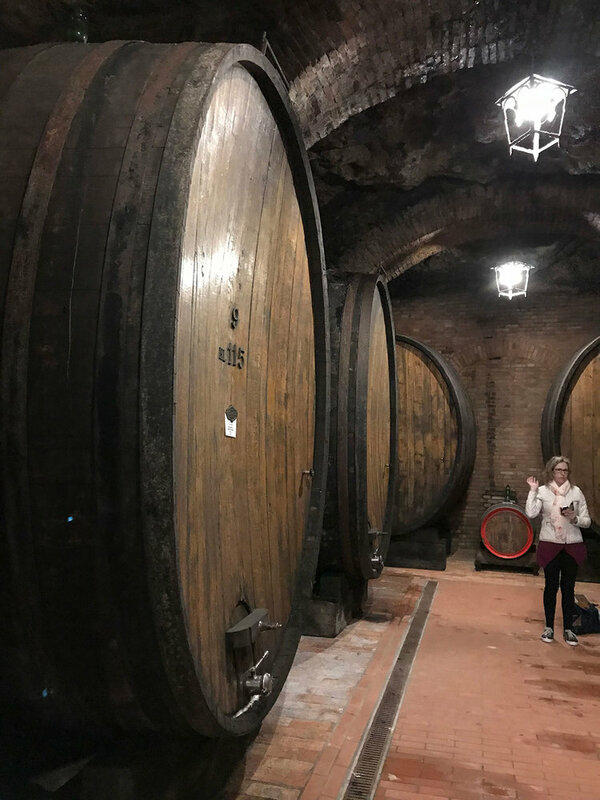 We hired her for a day, and we toured a winery in Montepulciano, a medieval hill town known for its amazing wine made from the Sangiovese grapes. We also visited a coppersmith who has been forging copper his entire life (he’s 82). He was so excited to make Rachael and me a copper medallion with our initials and date. 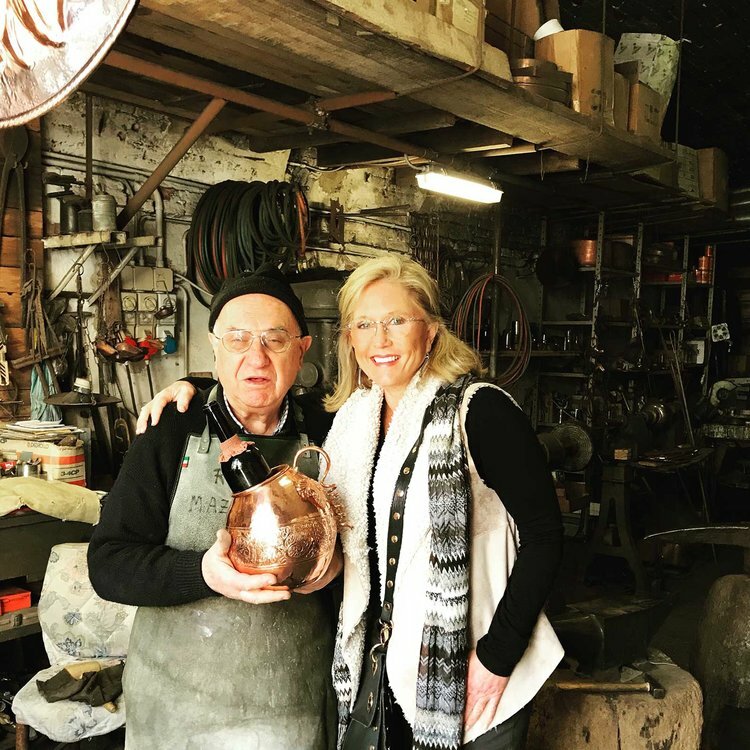 Down the street was a shop that sold his incredible copper wares, including hammered spoons, ladles, pots, and beautiful wine carafes. 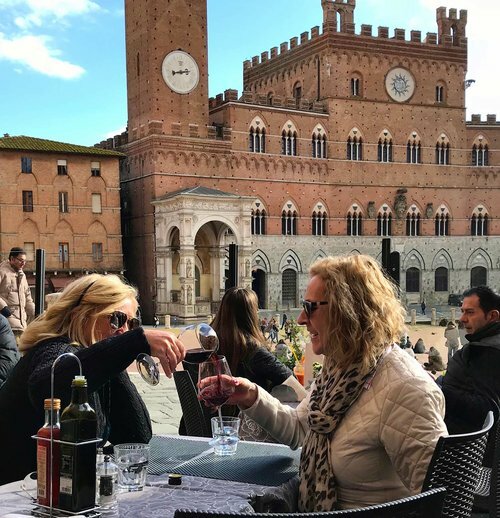 Antonella took us to the town of Pienza, a UNESCO World Heritage Site. It was possibly the most charming city I’ve ever visited, and is one of the best examples of Renaissance architecture. It’s the capital of Pecorino cheese, and there are quaint little cheese shops scattered about the town. Antonella did a superb job of guiding us through these towns and explaining the history, food, wine-making and anything we wished to know about the area. 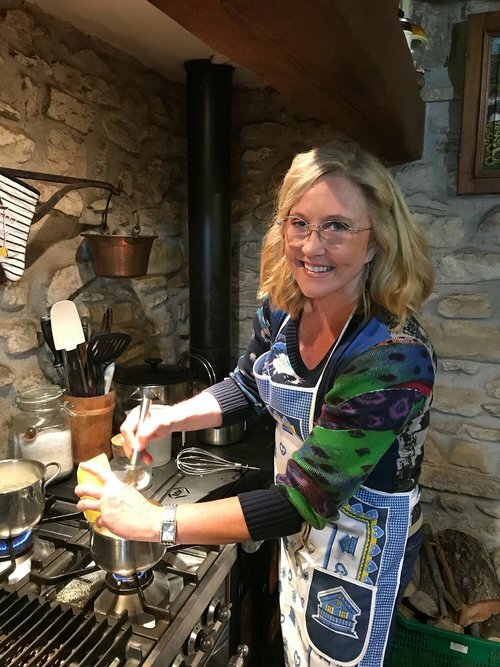 Another highlight of our Cortona experience was a cooking class with Ryan Hanley in his quaint country home set in the valley near Cortona. I teach cooking classes myself (in Tulsa and wherever I can), and I always hope that by learning from other chefs I will become better. Ryan is American, but has lived in Italy with his Italian wife, Deborah, for 14 years. They were absolutely delightful, and they had a magnificent kitchen in their home set up perfectly for cooking classes. 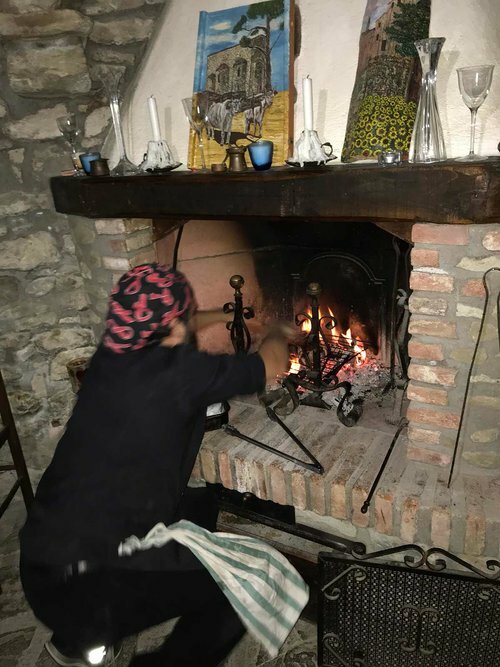 We spent four hours cooking numerous Tuscan dishes and listening to Ryan explain the traditions and methods for making each of them. Deborah was thoroughly entertaining as she told stories of her life in Italy and teased Ryan about American food traditions. Their home has a charming old dining room with stone walls and a wood fire place (we grilled steaks on the fire). It has a long dining table perfect for dinner parties where Ryan can be hired to prepare meals for groups of up to twelve. We left full of good food, recipes, and promises to recommend him to our friends. It was a fantastic cooking experience! Our last day of our Tuscan holiday was spent in Florence for a short day trip. Rachael had never been to Florence so we took the one-hour train ride to the famous city. Unfortunately, it was raining and very cold. And, unlike the other cites we had visited, which had virtually no tourists, Florence was packed with them. 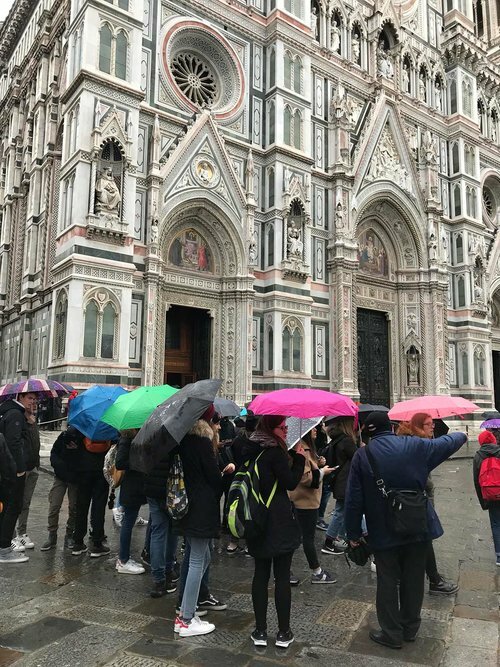 Even in the rain, hundreds of people stood with their umbrellas waiting to get into the Duomo. We walked around the city center and to the famous Ponte Vecchio bridge where there are numerous jewelry shops. We found a beautiful hotel nearby and stopped there for lunch. We looked out onto the river where it was pouring rain, and ate hamburgers and french fries, smiling the entire time. We had had our fill of pasta, and couldn’t wait to sink our teeth into a juicy burger. After two hours of relaxing in the hotel lobby, we trekked our way back to the train station and returned to Cortona for our last night. We both wanted pizza for dinner, so Francesco took us to his favorite pizzeria, Ghiottone De Mauro. Of course, we ordered two pizzas, spicy sausage and quattro formaggi. We ate half of the pizza and gave the rest to Francesco when he picked us up. Our holiday ended in Rome as Rachael and I said our goodbyes, knowing we would see each other again soon. We both agreed we hadn’t laughed so much in a very long time, and we would miss talking about food and wine nearly non-stop. We made many notes and took lots of photos, promising to go home and make some of our Italian food discoveries. Meanwhile, we’ll forever be grateful for that Indian holiday six years ago that began a friendship of a lifetime.